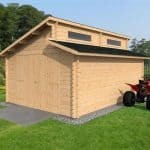 Big enough to store 2 vehicles, this large field barn garage is a unique and stylish addition to any home. It has been constructed to withstand the elements.. 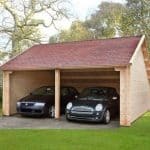 This elegant wooden car port is a fantastic choice for those looking for something a little more unique. With a large, open design, the port has space to.. 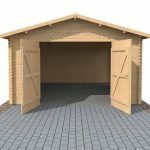 This 4 x 2 log cabin garage has 44 mm thick timber units throughout it. This is incredibly thick wood, and shows just how strong and durable this.. 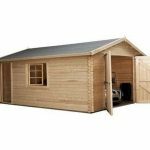 If you’re looking for a stylish, secure garage, this incredible log cabin is a fantastic option. Offering ultra-thick cladding, the building comes with impressive security and privacy. It.. This bold, architecturally striking log cabin boasts a fantastically modern design that will look great in any garden. It comes with thick double glazed static windows, 44mm thick.. This is an incredibly large building that has mainly been designed as a garage, though it would also be suitable as a good sized workshop. Its attractive design..
Not just a garage, with its handsome good looks this is a popular log cabin too. The Bradenham has generous double doors allowing ease of access to your vehicles.. 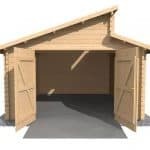 This is a superb large building which works as a log cabin or a garage for your precious vehicles. 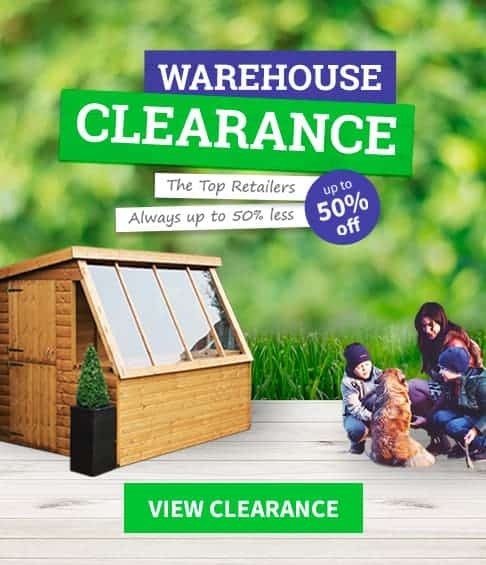 It is attractive and built out of strong 4..
Beware if you are choosing this as a garage as it’s really too good to use as a garage, with its handsome good looks which is why this is.. 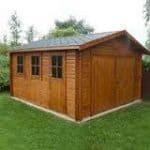 This is almost too good to use as a garage, with its handsome good looks which is why this is a popular log cabin too. Extra spacious and grand.. This building is almost too good to use as a garage, with its handsome good looks which is why this is a popular log cabin too. It offers plenty of..
For something large, attractive and functional then this is a high quality, exceptionally good looking outdoor building which doubles up well as a log cabin or a garage for.. 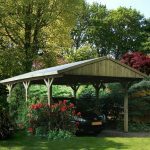 If you are looking for both a garage AND a log cabin then the Bradenham acts as either. For something large, attractive and functional then this is a..